These triggers are guaranteed to increase your email click through rate. 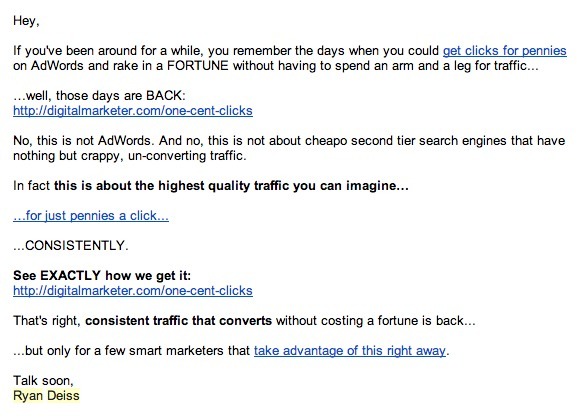 You’ll see four emails we sent to over 350,000 people that had high click-through rates. Each email contains one or more of these principles of persuasion. Access your ‘Simple 7-Step Autoresponder Sales Sequence’ Execution Plan in Digital Marketer Lab. Write a quick autoresponder email series that sells a product or service on autopilot. What will I gain if I click on this link? That’s what your reader is wondering and you need to answer it. Your email copy should make a promise that clicking on the links in the email will deliver a specific gain. That promise might be obvious or subtle. It’s true. People buy for emotional reasons — but they justify the purchase with logic. If you’ve appealed successfully to a buyer’s emotional side, it’s time to give them something practical to justify the purchase. Use statistics, odds, comparisons, expert opinion and other practical facts to encourage email clicks. 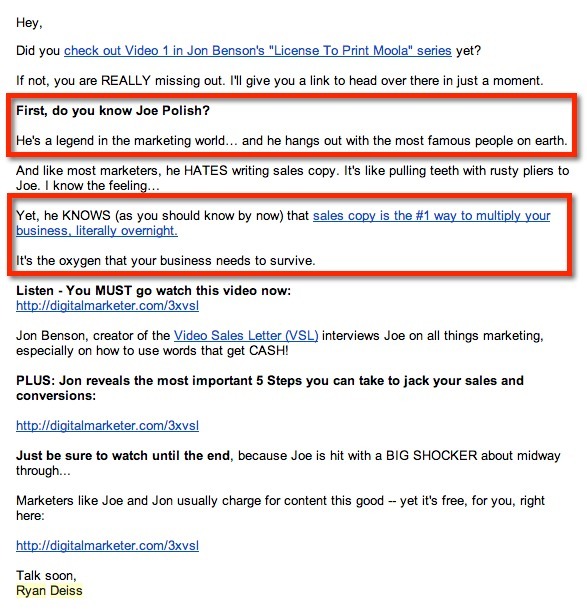 A recent email from Ryan appeals to our logical side by mentioning the legendary Joe Polish. Ryan pins the statement that “sales copy is the #1 way to multiply your business…” to a highly respected expert, Joe Polish, and states that you should know what Joe Polish knows. Pretty logical, right? Joe Polish is successful. If I know what he knows, I’ll be successful too. Be careful with this one but understand that fear is often more motivating than gain or logic. With the right audience and the right promise, you can get outstanding click through rates when you instill fear into your reader. Survival Life sells to a market that is concerned about natural disasters and other scenarios that will put themselves and their families in danger. The products we sell to this market are among the best in the industry at helping people prepare for these scenarios. Just as in the life insurance or retirement planning space, we are selling the peace-of-mind that one feels when they are adequately prepared to deal with something frightening. 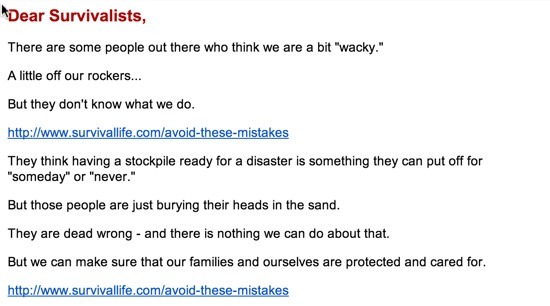 If you’re on the fence about taking the time, energy and money needed to protect you and your family from a disaster, this email might frighten you into action. If you want to encourage action, your reader must understand what they will gain or what you will protect them from if they do take that action. But it’s a funny thing. If the reader feels that there is no urgency to take action NOW, often they won’t do it. If you want to increase click-throughs on your emails, you need to communicate that what you have for them is limited in some way. 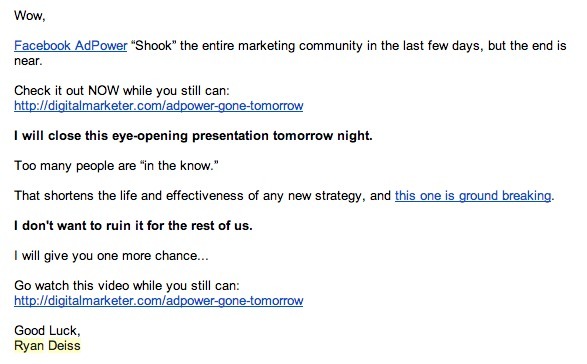 In this email for Facebook AdPower, Ryan lets you know that the program is closing. If you don’t take action now, the gain you could have had will be gone. Experiment with the order in which you push these buttons. Try GAIN > FEAR > LOGIC > SCARCITY. Then, switch it up and test FEAR > LOGIC > GAIN > SCARCITY. Also, experiment with emails that focus on a single emotional trigger and others that combine more than one. What questions do you have about increasing the click-through rate on your emails? What advice do you have for the rest of us? Let us know in the comments section below.